When Professor Elaine Crane was honored by Fordham University with funding for scholarly activities to mark her elevation to the rank of Distinguished University Professor, she generously offered the funds as one-time research grant awards for graduate students in US history. In the coming weeks we will profile the research projects undertaken with support of the Crane fund. This week: a week in the archives in New Orleans with Jacquelyne Thoni Howard. For Jacque’s report from New Orleans, read on. I remember asking the archivist at Tulane University’s Special Collections, in New Orleans, “would you mind checking again, please?”. As he graciously obliged in checking around the home of this particular document bundle for an additional folder, I scoured the archive folder for the approximately 370 missing pages of primary source material. In the end, I gratefully scanned the available pages originally handed to me. Meanwhile, however, I tried to shake off that gut feeling that I was missing something big in those absent pages. This instance of uncertainty occurred, during this past summer, when I conducted an altogether successful research trip at archives and academic institutions on the Gulf Coast. The Elaine Crane Research Grant in U.S. History made the research conducted in New Orleans possible. This research I conducted in New Orleans contributed to a research paper and future dissertation chapter titled “French Imperial Prescriptions and Colonial Families: Perceptions of Agency in Colonial Louisiana, 1685-1763.” Most notably, during the week I stayed in New Orleans, I researched at The Historic New Orleans Collection, Tulane University’s Louisiana Research Collection and Loyola University New Orleans Special Collections and Archives. At these three institutions, I established contacts, found invaluable sources for my research, and learned more about the holdings available for future research trips. For The Historic New Orleans Collection, I originally planned a scouting trip for future research. In the process, however, I also purchased a copy of the recently published memoir of Marc-Antoine Caillot titled, A Company Man: The Remarkable French-Atlantic Voyage of A Clerk for the Company of the Indies. This source proved invaluable for my research paper on French Imperial directives stemming from the Company of the Indies to Louisiana inhabitants. Next, at Tulane University’s Louisiana Research Collection, I found another invaluable source, mentioned above, for my research paper. 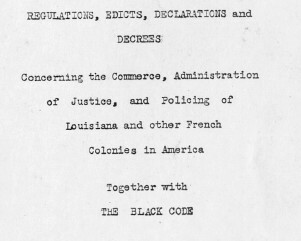 This source, Regulations, Edicts and Declarations and Decrees Concerning the Commerce, Administration, and Justice of Policing Louisiana and other French Colonies in America Together with the Black Code, explained specific laws that the French imperial administration placed on Louisiana inhabitants. The invaluable portion that I scanned dealt with race relations in the colony between African slaves and French settlers. Unfortunately, the missing part of this manuscript did not turn up. Lastly, I found reels of microfilm, titled “Correspondance a l’arrivee en provenance de la Louisiana,” at my Alma mater Loyola University New Orleans. Finding a copy of this manuscript collection in the United States and more importantly at the familiar Loyola University New Orleans’ Monroe Library consisted of my biggest find. I plan to focus future research trips on gathering more from this one file and also looking for the missing pages at Louisiana State University. Considering these finds, as I left New Orleans, I reflected that the trip ended successfully. I found three invaluable large bundles of source material, possessed copies of sources needed to complete my research paper, and left with an insatiable enthusiasm to spend more time at home in New Orleans finding more material. Months later, thousands of miles away, I cannot seem to kick that hopeful and yet dreadful thought, that I am missing something big, specifically 370 pages big.